Apple site: Apple - Final Cut Pro X - A revolution in creative editing. 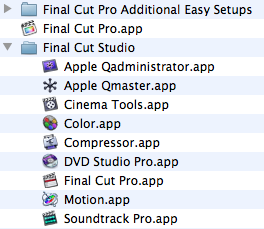 Installing FCP X seems to reorganize the apps from Final Cut Studio into their own folder. Guess there's time to wait for evaluations to come in. And to see if Adobe or Avid do any special deals! How will it handle AVCHD? £179 in the UK with Motion and Compressor at £29.99 each - bargain! I will not be ditching final cut pro 7 just yet for major projects.. but that doesn't mean that I didn't just buy it and we'll start testing it now... I'll report back. Cool! FCP X supports the h.264/AVC hardware assisted encoding/decoding with the new Intel Sandy Bridge CPUs, that should be a nice boost to performance. And it can natively use iTunes, Aperture & iPhoto as media management libraries. Audio features look good, J&L cuts look like a snap, and the included Logic effects, narration & downloadable audio content are pretty beefy. No word any kinda of DVD authoring much less Bluray. I dont expect another DVDSP but I would expect some kind of DVD exporter. Yes there is basic DVD and Blu-Ray export just as with FCS3. I'm looking forward to trying this out soon! I am/was hoping BD and DVD authoring would be more robust. Those who edit with DSLR and:or AVCHD will rejoice. The thing is FAST! finally. But don't throw away FCS3 yet. FCPx has lots of potential but tape ingest except for FireWire, XML and OMF are gone. Also no fcp7 project import. Yet. Color looks like it was rolled into FCpX. But I think Apple might have a new version in the future. Yeah, don't toss out FCS 3 yet! I don't think Soundtrack Pro or Color will be sold separately -- I just watched the video on Apple's site and it's all built-in nicely now. Greg, have you loaded FCP X and been able to keep FCP 7? I added links in the original post for the User Guides for FCP X and Motion 5. FCP 7 is not overwritten, just moved to another folder in the apps folder, FCPX takes over the existing icon in the dock, but you can put the FCP7 icon right next to it if you want! You can keep older versions and run them on the same system, just not at the same time. FCP X will give you a warning.